Widely recognised as the world leading manufacturer of precision tooling, toolholding, boring, spindle innovations and the inventor of the BIG PLUS dual contact face and taper spindle system, BIG KAISER will be prominent at MACH 2018 on the Industrial Tooling Corporation (ITC) stand. The BIG KAISER brand will have its groundbreaking technology and improved productivity solutions promoted on Stand H20-650 by industrial experts from both ITC and BIG KAISER. From the 9th to 13th April at the NEC in Birmingham, the ITC stand will be packed with new cutting tool developments that will include the new ‘micro milling’ product extensions from ITC, a raft of new indexable insert milling solutions from Widia and new product lines from BIG KAISER. Many of the new product lines will be receiving their world premiere whilst the latest BIG KAISER and Widia product innovations will receive their UK exhibition debut’s following global launches at the recent EMO trade fair. Attracting MACH visitors to the ITC stand will be a high performance motorcycle from the Suter racing team. Whilst the racing bike will inevitably attract MACH visitors, it will be the groundbreaking innovation from BIG KAISER that will certainly leave a lasting impression on show attendees. At EMO, BIG KAISER launched four new product innovations that will all be shown at MACH 2018. 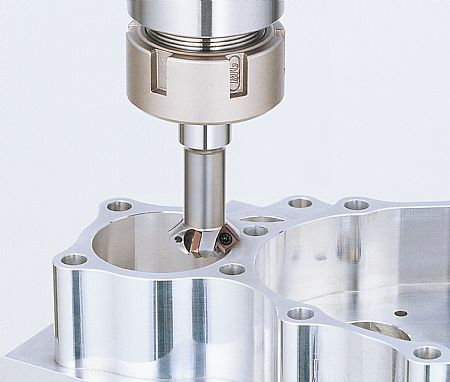 Among the new developments will be the new EWE Digital Fine Boring Head with Wireless Connection. 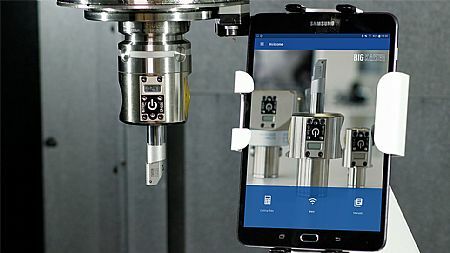 This line of second- generation boring heads incorporate wireless connectivity to BIG KAISER’s user-friendly Smartphone and tablet App for simplified tool monitoring and configuration. With the first generation line of precision boring heads proving particularly popular among ITC customers, the latest edition is certain to prove a hit at MACH. By connecting to BIG KAISER's App, manufacturers will find it easy to monitor and configure the boring head while assembling and running boring tools. The App helps operators determine optimal cutting parameters for their tool assemblies and it also displays changes in cutting diameters. Furthermore, it logs the tool adjustment history for future reference. Such is the level of innovation behind the EWE; that BIG KAISER has applied for two patents for the new system. One is the RF antenna that radiates through the display and battery positioning and simplifies replacement. By building new technology solutions and using its in-house electronics expertise, BIG KAISER is ensuring that it stays at the forefront of Industry 4.0 developments. Alongside the next generation EWE digital boring system, BIG KAISER will be launching its new line of EWN fine boring heads. Capable of boring holes from 0.4 to 152mm diameter, the EWN incorporates a large dial disc for parallax-free reading. This technology allows end users to execute precision diameter adjustments of just 0.001mm. Available for DV, HSK, BT and Big Capto spindle configurations, the EWN is offered with a complete line of boring heads for the most precise boring solution that money can buy. To further enhance the precision of the BIG KAISER tools, customers will have the opportunity to see the new Base Master Series at MACH. This precision touch sensor line has been extremely popular among ITC customers since its recent launch. Capable of determining workpiece off-sets and measuring tool length, the Base Master can be easily mounted on the workpiece surface or the machine table to provide precision levels of +/-1micron. The Base Master operates when a conductive circuit is completed whereas the Base Master Gold can measure non-conductive materials and tools such as ceramics. For micro cutting tools, the Base Master Micro generates a low measuring pressure that protects the cutting edges of precision tools and this is complemented by the Base Master Mini, the world’s smallest system for working in compact work envelopes. Keeping its focus on precision and fast set-up times, ITC will also be introducing the BIG KAISER CTL-90, a new compact centring tool designed for small lathes and turning centres. The CTL-90 has a stationary dial gauge that faces the machine operator at all times, rather than rotating with the spindle of the lathe. 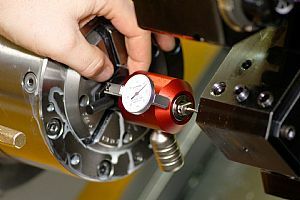 This simplifies the tool and lathe chuck centring process, thereby saving valuable set-up time and improving operator productivity. In fact, machine setting can now be conducted from outside the machine when using the CTL-90. The fine adjustment mechanism on the tool enables precise adjustment to within 10microns with a stroke of 2mm. Setting can be achieved with the spindle rotating at a speed up to a maximum of 100rpm. The ITC stand at MACH 2018 will have a wealth of irresistible product offerings that will include the FullCut Mill, the most comprehensive precision boring and hole-making line as well as the ultra high feed C-Cutter Mini and C-Cutter for chamfer machining. The new C-Cutter Mini that is available in the UK also marks the introduction of the world's smallest hex insert, with a diameter of 3.97mm. This particularly small dimension enables highly-efficient back chamfering from a 6mm starting-hole diameter, whilst the 3-corner insert design reduces costs. To witness the benefits that the remarkable BIG KAISER product range can provide, visit the ITC Stand H20-650 at MACH 2018.